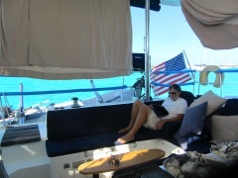 Last night we watched The Hunger Games on Sail On, a Lagoon 440. We had seen Marie and Craig in New River, Bimini and then again in Big Majors. Popcorn, Rum Punch and a movie.....a relaxing evening. 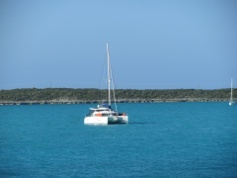 We left the Big Major’s anchorage this morning and went into Staniel Cay for fuel. We left there at 11:50 and arrived in the Blackpoint anchorage 1.5 hours later. The wind was around 12 kts and we were going directly into it, so we motored the whole way. We are on our way to Georgetown with stops in Blackpoint, Big Farmer’s Cay, and Leaf Cay. 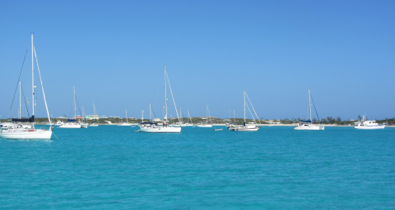 From there we will go outside on Exuma Sound to Georgetown Thursday and Friday are supposed to have calm seas and light winds. There is a cold front coming through on Saturday night and Sunday which is supposed to bring winds of 25 to 30 kts. That could change but we want to get to a protected anchorage in Georgetown where we’ll spend a few weeks. On the way here, I did laundry, charged the computer and phone, made ice and watched TV. We also made water. Tomorrow, I’ll probably bake bread and do more laundry on our way to Big Farmer’s. We always try to take advantage of the power from the engines when we are motoring. Once we got to the anchorage, we hung out the laundry in the cockpit and Mark sat down with the iPad to read Chris Parker’s forecast sent out this afternoon. It’s so nice to have a strong signal on the iPad so we can still read our email and get online no matter where we are. 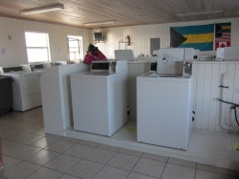 Blackpoint is known for having “the best laundry in the Exumas.” We don’t need to use it, but many boats don’t have washer/dryers on board, so they look forward to using the laundry facilities. Blackpoint is also a destination because of Lorraine’s Cafe. She has good Bahamian meals and a wifi room, where she provides free wifi. Donations are accepted and hopefully cruisers leave money. 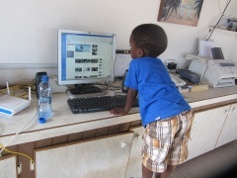 In the photo, her grandson is using a computer in her wifi room. Our wifi extender does not pick up her network, even though we are anchored near it because it doesn’t broadcast outside her walls. However, we are picking up the free wifi from Scorpios Bar.